ARLINGTON, Wash. — Alfred Lee Rowe of Arlington, Wash., died Jan.13, 2005, in Everett, Wash., after an extensive operation for heart failure. He was 63. 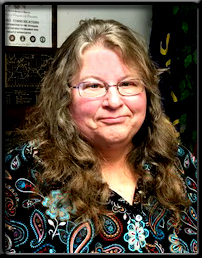 Funeral services will be held at 1 p.m. Saturday, Jan. 29, at Crossroads Christian Center, 109 W. Main St., Molalla. Gravesite services at Millers Cemetery, between Molalla and Silverton, will follow. He was born in Silverton on October 28, 1941, to Orvin Earl Rowe and Lily Marie (McClasky) Rowe. He graduated from Silverton High School, and served in the Army Reserves. He moved to Arlington area in 1966. He had accomplished many things in his life and he will be greatly missed by everyone who knows him, family says. He enjoyed many things in life such as working on cars, rock hounding, driving tractor trailers, motorcycles and being a foundry man. He had his own little foundry at home where he made belt buckles, castings and other types of trinkets. He was a member of the Eagles Club in Granite Falls, Wash., and a motorcycle news club. He is survived by daughters Cordelia (Jane) Packard Rowe and husband Dennis of Arlington, Myrna Mann Rowe and husband Grammar of Lake Stevens, Wash., and Aretta Rowe and husband Sid V. of Arlington; son Alfred (Andrew) Rowe of Hoquiam, Wash.; seven grandchildren; sisters Alveta Gibboney and husband Harold of Molalla and Maurita Adkins of Oregon City; brothers Marvin Rowe and wife Bunne of Canby, Jim Rowe and wife Roberta of Coos Bay, and Richard Rowe and wife Glenna of Cullowhee, N.C; and ex-wives Barbara Rowe of Granite Falls, and Wanda Rowe of Westport, Wash.
Hard copy from the Woodburn Independent, Molalla Pioneer, & Canby Herald January 22, 2005. Page 14. What a beautiful human being you were. I didn’t get to see you enough, or talk to you enough. But, I am glad for the time that we had. I hope I’ll see you in heaven. Course, I am assuming that I will make it. I might be too assuming! I never knew you as anyone but sweet. You were the one person who stopped by to see me when I spent my time in Hell…. oh, I mean, Ohio. (sorry folks). You died too young… but, I am glad that I got to meet you, and have time with you. I love you, Peggy Rowe. 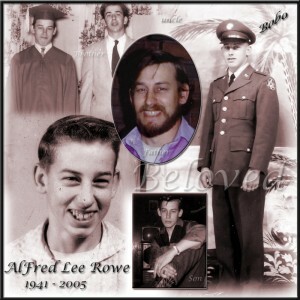 If you have a story, photo, memory, or anything related to Alfred (Bobo) Lee Rowe you would like to share with others please contact me and I will put it up on the page here.